Du Quoin, Ill. (September 6, 1971) - If Greg Weld and A. J. Foyt shared a common "crying towel" Monday at the Du Quoin State Fairgrounds, they had good reason. Weld, the day's top qualifier, ran as the leader for 91 laps before George Snider overtook him to win the 100-mile big car race. Weld jumped to an early lead and was never headed until lap 92 though troubled throughout by his smoking Plymouth. "It was running at about 280 degrees since the race's halfway point," an uncomfortable warm Weld said after the race. "And the back end was loose and wore down my rear right tire," he said. "I was just hoping I could finish," Weld said. A red-hot, sometimes smoking car ran at 280 degrees the final 50 laps and sent a feet-blistered Weld scrambling for the refreshing waters of the infield lagoon. Foyt, the crowd favorite, had dueled Mario Andretti, another Du Quoin favorite, for third in a close first 40 laps, four-car race. Weld, Snider, Andretti and Foyt had run in that order for the' biggest share of the first 40 laps. Then Foyt shredded the first of two right rear tires (he also later shredded a left rear tire) and was forced to the pits. Foyt lost a lap on each of the three pit stops and finished ninth, three laps behind, though the crowd continued to cheer his efforts throughout to un-lap himself from the leaders each time he re-entered the pack. Weld jumped to an early lead and was never headed until lap 92 though troubled throughout by his smoking Plymouth. "It was running at about 280 degrees since the race's halfway point," an uncomfortably warm Weld said after the race. "And the back end was loose and wore down my rear right tire," he said. "I was just hoping I could finish," Weld said. Once Snider made it around Weld on the start of lap 92 the California native easily sped away from the early leader who then "backed off" somewhat as he saw the "handwriting on the wall." A crowd of 15,028 cheered Snider’s dogged efforts politely, and then laughed some as Weld jumped from his hot car and headed for the infield lagoon at the race's completion. But to for both Weld and Foyt, Sunday's race was no laughing matter. Weld had to settle for $3,688 with his second place finish compared to the $6,323 won by Snider. 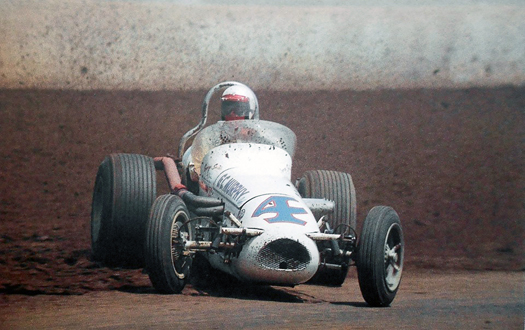 Three blown tires and a ninth place finish were disappointing for the always-competitive Foyt.